Hilma af Klint, The Ten Largest, No. 7., Adulthood, Group IV, 1907. Tempera on paper mounted on canvas, 315 x 235 cm. 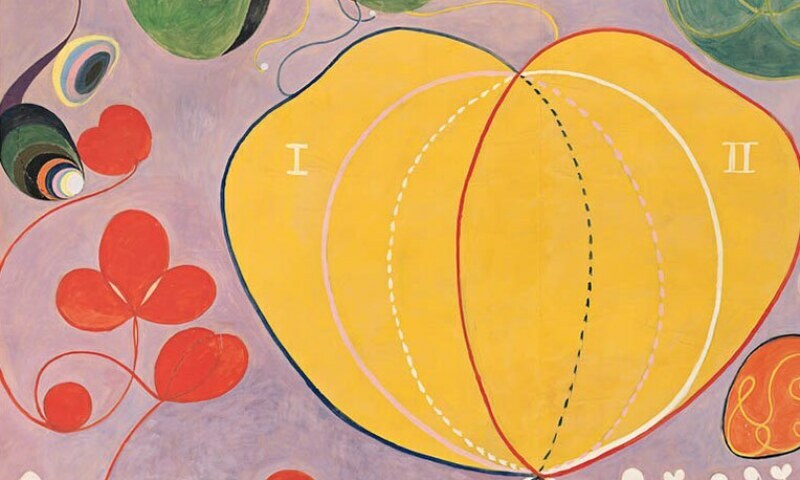 When Hilma af Klint began creating radically abstract paintings in 1906, they were like little that had been seen before: bold, colorful, and untethered from recognizable references to the physical world. It was years before Vasily Kandinsky, Kazimir Malevich, Piet Mondrian, and others would take similar strides to rid their own artwork of representational content. Yet while many of her better-known contemporaries published manifestos and exhibited widely, af Klint kept her groundbreaking paintings largely secret. She never exhibited them and, convinced the world was not yet ready to understand her work, stipulated that it not be shown for twenty years following her death. Ultimately, her work was not exhibited until 1986, and only over the subsequent three decades have her paintings and works on paper begun to receive serious attention. Af Klint was born in Stockholm in 1862 and went on to study at the city’s Royal Academy of Fine Arts, graduating with honors in 1887. She soon established herself as a respected painter in Stockholm, exhibiting deftly rendered figurative paintings and serving briefly as secretary of the Society for Swedish Women Artists. During these years, she also became deeply involved in spiritualism and theosophy. These modes of spiritual engagement, which were also of keen interest to other artists, including Kandinsky, František Kupka, Malevich, and Mondrian, were widely popular across Europe and the United States, as people sought to reconcile long-held religious beliefs with scientific advances and a new awareness of the global plurality of religions. Af Klint’s first major group of largely nonobjective work, The Paintings for the Temple, grew directly out of those belief systems. Produced between 1906 and 1915, the paintings were generated in part through af Klint’s spiritualist practice as a medium and reflect an effort to articulate mystical views of reality. Stylistically, they are strikingly diverse, incorporating both biomorphic and geometric forms, expansive and intimate scales, and maximalist and reductivist approaches to composition and color. She imagined installing these works in a spiral temple, though this plan never came to fruition. In the years after she completed The Paintings for the Temple, af Klint continued to push the bounds of her new abstract vocabulary, as she experimented with form, theme, and seriality, creating some of her most incisive work. This survey of Hilma af Klint’s work will be the first major solo exhibition in the United States devoted to the artist, offering an unprecedented opportunity to experience af Klint’s stunning and long-underrecognized artistic achievements. Organized by Tracey Bashkoff, Director of Collections and Senior Curator, the exhibition will focus on the artist’s breakthrough years, 1906–20, when she first began to produce nonobjective paintings and continued to push the bounds of her newly discovered visual language.